Possibly the greatest producing bull of all time "JP Rio Grande" over the beautiful 80"+ ttt "Asocl Burning Desire" who is producing awesome progeny. 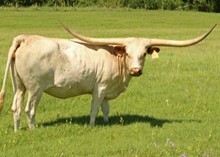 This young bull is more than impressive in color, horn and conformation. He has a lot of deep color and His first calves are showing that he will throw his maternal color & conformation. He has a lot of total horn and now all that horn is turning back up to add to his impressive 70" ttt @ 36 months. Consistency in the pedigree!